Click here for our favorite pictures from this section. 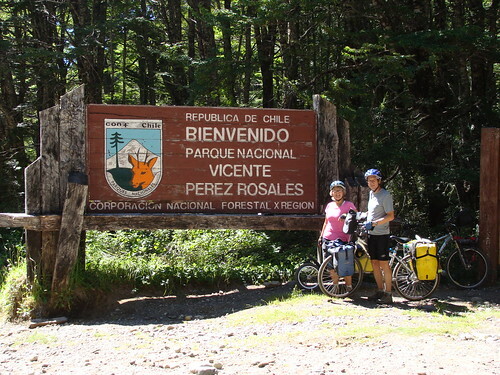 We took an incredible bike-and-boat tour from Argentina to Chile. 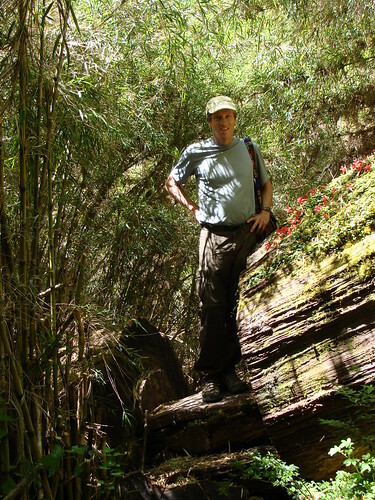 The "Andean Lakes Crossing" combined boat rides through two majestic thickly forested national parks, hiking, and biking touring. 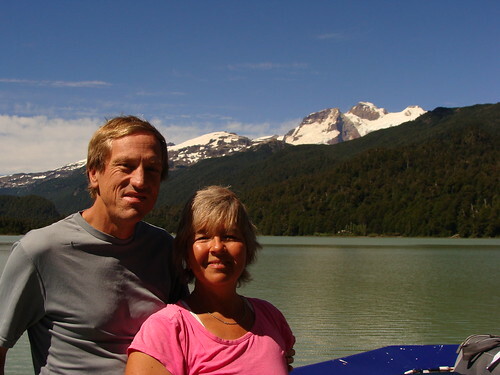 We started from Bariloche, Argentina and ended up in Puerto Montt, Chile. We emptied out the apartment we had been renting in Bariloche, Argentina and loaded our bikes with the gear that had been spread out all over the apartment for the last month. My bike was heavier then usual because I had purchased some new clothes and art supplies but some how it fit, especially because I offloaded some of the art supplies to Randy. We left at 6:00 in the morning, pedaled 20 quiet kilometers to the boat dock at Llao Llao (pronounced Zhao-Zhao in Argentina). After loading our bikes on to the front of the giant catamaran and purchasing a nice cup of cappuccino we settled down for first of three boat rides. The first was across Lago Nahuel Huapi which was surrounded by huge mountains and we reached Puerto Blest after a couple of hours. We disembarked and rode an easy 3k for the next short boat cruise across Lago Frías. 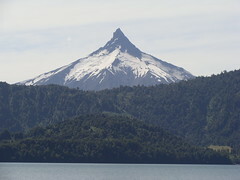 While cruising through the calm waters we came around a corner and there in front was the majestic volcano Tronador. 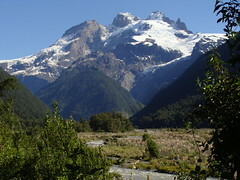 The snow-covered triple-peaked volcano shone more brightly under the clear blue mid-day sky. It was so close and big, it felt like I could reach out and touch the mountain. 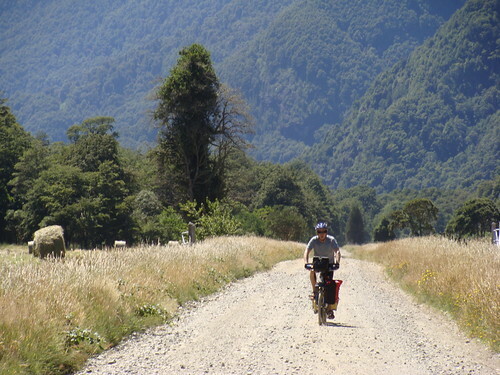 We stashed our bikes at the next landing and went for a hike in the wild Patagonian forest. Mostly we followed a river which was gray from the glacial silt that washed down the river in the currents and rapids. We crossed the river once on a huge fallen tree which also had a ratty network of guide wires strung for hand holds. It was rather scary crossing the natural bridge and scarier as the tree narrowed to next to nothing on the other side of the river. 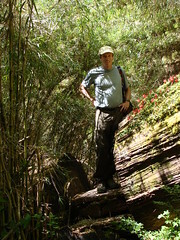 We continued the trek through bamboo forests and holly bushes. I had worn shorts and should have known better. The path we took was very wild and overgrown so I got scratched by the sharp edges of the low growing holly. After a few hours we returned back to continue on with our bike tour. We had been warned about our final 3 kilometers in Argentina, and we knew we'd be pushing our bikes. And we were. We dragged our bikes up that monster, but it was only a short ways and only about 250 meters of climbing, but oh, so steep and loose. The back of my calves ached after the two hour of pushing and we crested the pass. 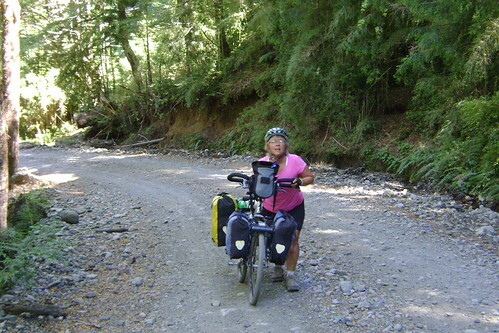 The next part was down hill for 8 kilometers but we had to ride slowly as the road was lined with large loose gravel waiting for us to blow it. Randy did lay down his bike but he somehow managed to run out of the fall and was standing laughing as his bike and trailer laid still in the middle of the dirt road with the back wheel going around and around. We camped in front of the Chilean border post. Since this was a national park which prohibited camping the only two official places were a hiking campground and a the border guard house. I must say that the camping was lovely. We had the whole place to ourselves, the use of the bathroom, access to clean drinking water and a the very best view of the Volcano Tronador with its massive glaciers hanging on the the steep ridges. It was the best view of any volcano we have seen anywhere on our trip. The only really bad part of this ride was the monster horse flies. The must be on steroids as they are twice the size of any I have ever seen. They are black with bright orange underbodies. They can fly more then 15 miles an hour and they swarm. Darwin's theory of the survival of the fittest is in effect in these parts of Argentina/Chile. The slow flies get killed and can not reproduce. Let me tell you how satisfying it is killing these creatures, oh it is a great feeling. The horse flies which can fly 15 kilometers an hour, kept up with us. They waited until we stopped for just a second and stung us through our clothes. Those that can fly fast get fed. Those that fly slowly, die of starvation. The mighty live on to reproduce and continue the gene poll of monster horse-fly-dom. We reached the small village of Peulla where we had to wait for 4 hours for last boat crossing. As we waited, I was in need of a shower to wash all the grit off. I asked at the homely yet expensive hotel if we could take a shower in a room that had not been cleaned yet. The desk clerk gave us a key to room 113 where we enjoyed a bath and a shower. Afterwards I returned the key to the desk clerk along with a tip. It was nice for him to risk his job so we could be more presentable for the last leg of this boat crossing. 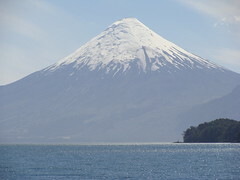 This time we traveled across the gigantic lake Llanquihue and past the impressive classical shaped volcano Osorno. It was even more impressive because it came right out of the lake and raised thousands of meters straight up. The top was draped with crisp white snow. Everyday of this three day trip had biking challenges. The next road was under construction and lined with a inches of ash. Every time a bus rushed by we got a face and lung full of the loss powder. After 27 kilometers, we reached pavement and headed to the grocery store and campground. This night was New Years eve and all the stores would be closed the next day so we had to buy supplies to last the next day and half. The campground was run down but offered pretty views of the lake Llanquihue. We enjoyed a glass of wine at the beach and reflected on the past year as we watched setting sun reflect off the volcano Osorno. We did go out to dinner at don salmon and had a delicious salmon meal. The campground came alive around 11:30 and final went to sleep around 4:00. We on the other hand where in bed by 11:30 and slept through most of the party. The final leg of this trip took us into Puerto Montt. The winds were strong and blew us all over. The 40 mile ride seemed like a hundred. The traffic was light, though, and we arrived in a city that was completely quiet for the New Year's holiday. We did manage to find a very nice hostel that took us in for the night, Hospedaje Familiar Nelda. A helpful and open family which run a hostal in a large seaport style wooden home. It is a place which is clean and has a lot of character and great beds. We are going to store our bikes there for two weeks as we take a plane south to tour the Torres del Paine National Park (in Chile) and go to El Calafate in Argentina, where we'll see the famous glacier Perito Moreno. Then we return here, take a bus to Santiago, and on January 14, we have a flight to Miami, Florida, in the US, where we'll ride to Nancy's dad's place in Naples, on the other side of the Peninsula.